"After trying multiple spinach recipes throughout the years, this one is my conglomeration with personal taste additions. Savory and delicious using primarily fresh ingredients. A new family favorite. Shiitake mushrooms can be substituted for other varieties. Broccoli can be omitted per personal taste." Melt butter in a large skillet over medium heat; cook and stir green onions and garlic until green onions are softened, about 5 minutes. Cook and stir turkey bacon in the green onion mixture until fragrant. Stir spinach, shiitake mushrooms, and broccoli into green onion mixture; cook and stir vegetables until softened, 5 to 7 minutes. Mix in 1/4 cup Cheddar cheese. Spoon vegetable mixture into the pie crust. Beat eggs, milk, sea salt, and black pepper together in a bowl; pour egg mixture gently over vegetable filling, slightly stirring eggs into the filling to combine. Bake in the preheated oven for 15 minutes; sprinkle 1/2 cup Cheddar cheese over the top of the quiche and bake 10 additional minutes. Cover quiche with aluminum foil and bake until quiche has set and a toothpick inserted into the quiche comes out clean, about 10 more minutes. 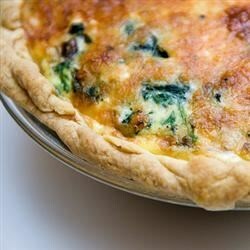 Allow quiche to cool for 5 minutes before serving. Great recipe! The shiitake mushrooms were fantastic. I also added a bit of goat cheese that I had lying around and needed to use up. It was a good idea!